SafeDay, Inc. is pleased to provide answers to your frequently asked questions. Click here to ask us your safety question. Do the OSHA standards permit employers to use aerial lifts to transport workers to and from elevated work stations where the basket is either set down on an elevated surface or placed at the edge of a structure? OSHA standards do not prohibit employees from exiting or entering an aerial lift basket that rests on or adjacent to an elevated surface. Section 1926.453(b)(2)(v) of the OSHA regulations requires that employees working from aerial lifts be tied-off. On the other hand, when employees move from the basket to the elevated surface, the requirements in 29 CFR Part 1926 Subpart M apply. In particular, 1926.501(b)(1) requires fall protection at 6 feet above a lower level. 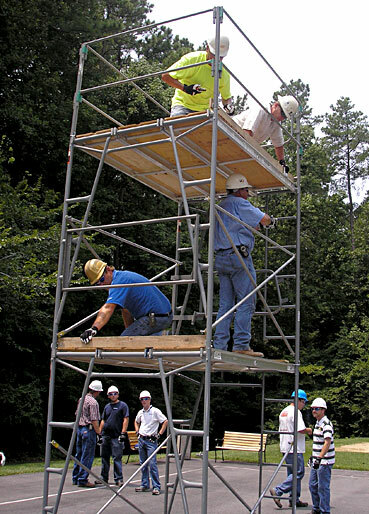 A worker may enter or exit an aerial lift (at heights above 6 feet) provided that fall protection such as guardrails or a fall arrest system is used while the worker moves between the lift and the working surface. A fall arrest system and its components must meet the criteria in §1926.502(d). During entry to and egress from the lift, a worker may tie-off to the lift (if the lift is designed to withstand the vertical and lateral loads imposed by the employee's movement itself or by an arrested fall) or to an appropriate nearby structure. Click here to see the OSHA Letter of Interpretation. What are OSHA's training requirements for a "Competent Person" in the context of the OSHA trenching and excavation regulations? In 29 CFR 1926.651 of the OSHA regulations, a "competent person" is defined as "one who is capable of identifying existing and predictable hazards in the surroundings or working conditions which are unsanitary, hazardous, or dangerous to employees, and who has authorization to take prompt corrective measures to eliminate them." While the requirement for a competent person appears several times in the OSHA regulations, you often have to look beyond the regulations to understand OSHA's intent for the level of training required for the competent person. As it relates to trenches and excavations, you need to look in the preamble for the rulemaking on excavations (FR 54 45909) issued on October 31, 1989. That preamble states that what constitutes a "competent person" depends on the context in which the term is used. In order to be a "competent person" for the purposes of the excavation standard, one must have specific training in, and be knowledgeable about, soils analysis, the use of protective systems, and the requirements of the excavation standard. One who does not have this training or knowledge is not considered by OSHA to be capable of identifying existing and predictable hazards in excavation work nor capable of taking the necessary corrective measures. When working from a scissor lift, is it permissible to anchor my personal fall arrest system to an overhead structure? Section 1926.453(b)(2)(iii) of the OSHA regulations which prohibits "belting off to an adjacent pole, structure, or equipment while working from an aerial lift," does not apply to scissor lifts. The aerial lift requirements (1926.453) incorporate by reference the definition of aerial lifts used in the American National Standards Institute (ANSI) A92.2-1969 standard. Scissor lifts are not addressed in that ANSI standard, and therefore are not covered by the aerial lift provisions. Since scissor lifts are a type of work platform, they are covered under the specific requirements for mobile scaffolds in 1926.452(w) and the general requirements for scaffolds in §1926.451. Sections 1926.452(w) and 1926.451 do not address hazards associated with tying-off to an adjacent pole, structure, or equipment while working from a scissor lift. Under Section 5(a)(1) (the "General Duty Clause") of the Occupational Safety and Health Act of 1970 (OSH Act), you would be prohibited from tying-off to the adjacent structure only in those situations where that practice is recognized as a hazard by the industry or by safety experts and another means of fall protection is feasible. ©2019 SafeDay, Inc. All rights reserved. Web Development by Atlantic Webworks.